The Total Solar Eclipse of 11 June 1983. The dark blue region is the Path of Totality (also known as the Umbra). The umbra shadow travels from west to east (left to right on the map). At the point of Greatest Eclipse, totality is at local midday. The duration of totality at greatest eclipse is 5 minutes 11 seconds. This occurs just north of the island of Java in Indonesia. On either side of that point, the duration is less. To the West of greatest eclipse the eclipse will be total before local noon; to the east, the eclipse will be total after local noon. The umbra is widest around the time of greatest eclipse as the Earth is bulging out towards the Moon in that region. The blue circlular regions are the positions of the umbra at ten minute intervals. The umbra becomes more circular around the region of greatest eclipse as the surface of the Earth is at its most perpendicular to the umbra. The Sub-solar Point is the location where the Sun is overhead at the time of greatest eclipse. This point is well north of the equator at this time of year (June). The red regions are the areas where the eclipse occurs during sunrise (left) or sunset (right). The area on either side of the path of totality (in pale blue) provides a partial eclipse, the magnitude decreasing with distance from the path of totality. Beyond the blue lines, no eclipse is visible. The path of totality begins in the southern Indian Ocean, crossing the islands of Java, Sulawesi and New Guinea and leaving the Earth in the Pacific Ocean north of New Zealand. The umbra takes 3 hours 1 minute to traverse its entire path. Our eclipse site was on the northern coast of the island of Java where the eclipse occurs just before local noon and the duration was over five minutes, close to the maximum for this eclipse. 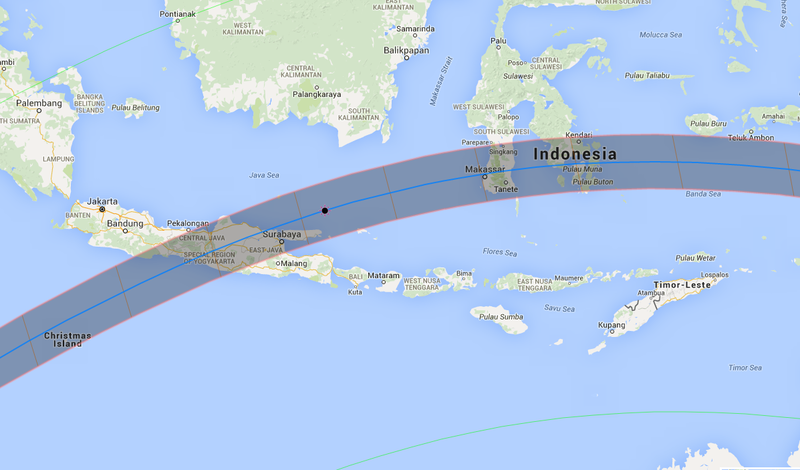 This shows the Path of Totality over central Indonesia. The path is shown by a dark area bounded by two red lines. The blue line in the centre is the Centre Line of the eclipse. The duration of Totality increases as the observer moves towards the centre line. The red lines crossing the path of totality are at ten minute intervals. The path crosses central Java and then swings across the Java Sea. At the point marked by a black Sun on the central line, the eclipse is at its maximum. The umbra then crosses southern Sulawesi. 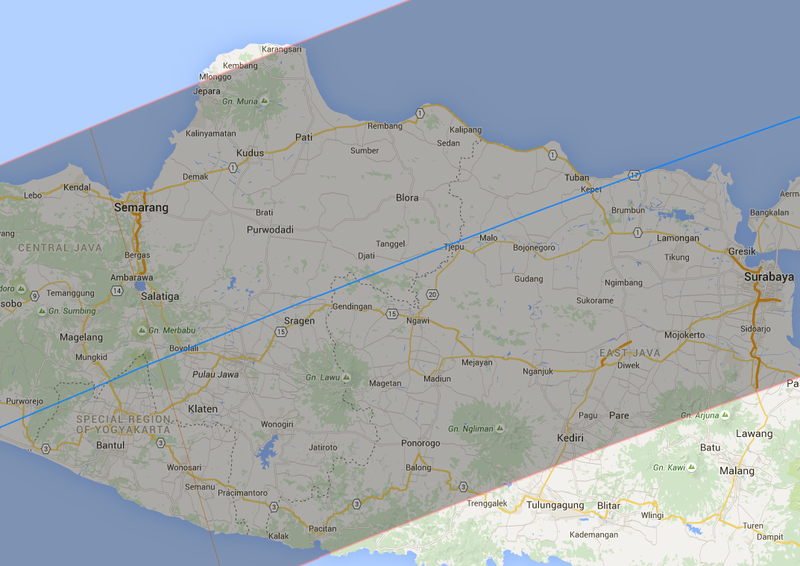 This shows the Path of Totality over central Java. Our eclipse site was in the town of Tuban on the northern coast of Java a few perpendicular km from the Centre Line (marked in blue). The Location of the observation site was the small village of Tuban on the northern coast of the island of Java. The Altitude (in metres) was estimated from our location close to a local beach. The Distance from Centre Line was originally estimated using a map with the path of totality plotted from Fred Espenak data. It was later updated using interactive eclipse maps from Xavier Jubier. First Contact is the beginning of the eclipse when the first "bite" appears on the Sun's disk; it is the beginning of the partial phase. Second Contact is the beginning of totality. Third Contact is the end of totality. Fourth Contact is the end of the partial eclipse - by that time we had packed up and left. The times are in local time which, for this eclipse, is UT + 7 (GMT plus seven hours). The Duration of the eclipse at the observation site was 5 minutes 09 seconds. The Path Width is the width of the path of totality. The value for this eclipse was 197km. This was a reasonably large figure that produced a long eclipse. The Sun's Altitude is measured from the horizon; the Azimuth is the direction of the Sun measured clockwise from North. The figures are for mid-eclipse. Gamma determines how the Moon's shadow, if extended, would pass through the Earth. A Gamma of zero implies that the shadow would pass through the exact centre of the Earth. A Gamma of greater than 1 misses the Earth and no total eclipse would occur. A positive Gamma passes North of the Earth's centre; a negative Gamma passes South of the Earth's centre. The value of Gamma for this eclipse is -0.4948. This means that the shadow passes South of the Earth's centre, about half of the way to the edge of the Earth. This, combined with the fact that in June, the Southern Hemisphere is tilted away the Sun, produces an eclipse in the Southern Tropical Zone. The Diameter Ratio determines how much bigger the Moon's apparent radius is than the Sun's. In this case, the Moon's radius is 1.052 that of the Sun's. A total eclipse can only occur if this figure is greater than 1. The Moon would then appear larger than the Sun and could cover it completely. If this figure was less than one a total eclipse could not occur because the Moon would appear smaller than the Sun. The Magnitude of the eclipse (1.025) is the fraction of the Sun covered by the Moon. For a total eclispe this figure must be greater than 1. The Saros is a collection of eclipses belonging to a series. Each member of the series is followed by a similar eclipse approximately 18 years, 11 days and 8 hours later. This eclipse is a member of Saros number 127. It is the 56th eclipse out of a total of 82 in the series, comprising 40 partial and 42 total eclipses. Saros 127 is unusually long lasting for 1460 years. It began on 10 October 991 with a small partial eclipse in the Arctic and will end on 21 March 2452 in the Antarctic. Between 1352 and 2091, the eclipses of this Saros were or will be total. The duration increased to 5m 40s on 30 August 1532, then decreased to to 4m 06s on 30 January 1767 before increasing to 5m 15s on 30 May 1965. The next eclipse of this series occured on 21 June 2001 and Kryss and Talaat saw it in Zimbabwe. At any one time dozens of Saros series are in progress. Other eclipses will belong to different series. The 1983 eclipse main page. Map of the path of the 1983 eclipse from Fred Espenak and eclipse details at the observation site. Accounts of the 1983 eclipse sent to this web site are reproduced here.